I came across this recipe on Pi's blog which she says is a recipe from Diana Henry's Crazy Water Pickled Lemons. As soon as I saw it I knew I would have to try it, the boiling up of the orange and then pureeing it was what intrigued me the most, also the fact that it has no butter or oil. It would suit the dairy free crowd (which isn't me but hey, just thinking of those who can't or don't! ), it would also be easily adapted to be gluten free, the flour content could quite easily be substituted with some fine cornmeal or rice flour. With lots of ground almonds in it, it is not the cheapest to make, but it is ridiculously easy, with the finished product being dense and moist and wonderfully 'orangey'. 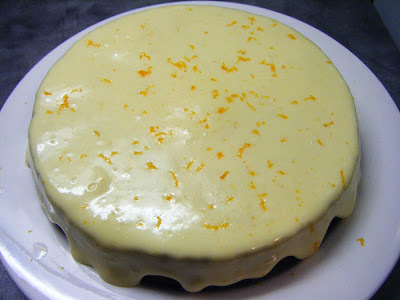 I made it decidedly not dairy free by adding a cream cheese icing instead of the suggested orange flavoured cream, I just used 250g cream cheese, the rind and juice of an orange and 2c icing sugar, beat it all up and spread it on. We enjoyed a slice for dessert (and then a few the next day with a cup of tea!). 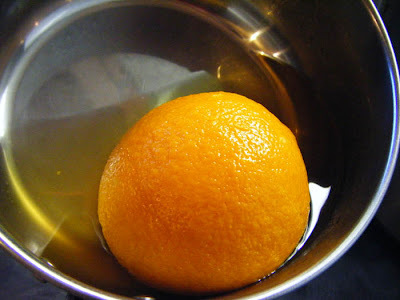 Put the orange in a saucepan, cover with water and simmer for an hour. Cut the orange in half, remove the pips, and purée the rest of the fruit in a food processor. Grease a 20cm (8in) spring-form tin and line with greaseproof paper. Preheat oven to 180˚C (350˚F) Gas Mark 4. Beat the eggs and sugar together until they’re pale and thick. Fold in the flour, baking powder, almonds and orange purée. 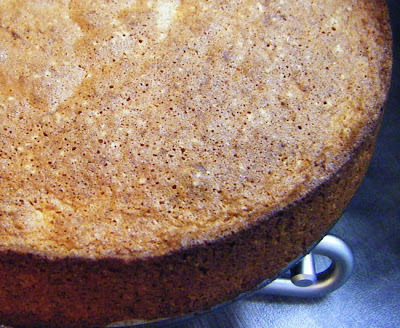 Pour into the tin and bake in oven for about an hour, or until skewer inserted into the middle of the cake comes out clean. 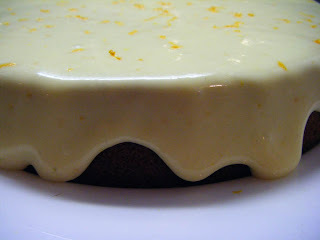 Turn the cake out to cool To make the cream, melt the marmalade in a small pan. Let it cool slightly, but don’t let it set, then mix it with the mascarpone and yoghurt. Add icing sugar to taste and the orange flower water. Sift icing sugar over the cake and serve with the marmalade cream. So I'm most definitely going to be making this today! Thanks! This looks delicious! I just made a birthday cake with blended mandarin oranges. I didn't think to boil them I just couldn't get the zest to come off and the juice to come out. Since they are sweet, I figured it would work just fine. I am marking this recipe to try it sometime. Sounds fun! It looks fabulous, yum yum! 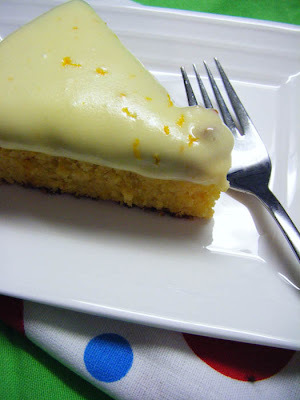 The method reminds me of Nigella's clementine cake which is one of my most favourite cakes ever! This looks gorgeous and delicious. I am definitely marking this recipe! This really looks tasty. Love the icing!